Happy birthday Lynn Hall (Barry the Bravest Saint Bernard) and Bert Kitchen (Whoo Goes There?). It’s the birth date of Robert Penn Warren (1905-1989), Remember the Alamo!, and Evaline Ness (1911-1986), Sams, Bangs, and Moonshine. Best birthday wishes to the Library of Congress, established by John Adams in 1800. Read American Treasures in the Library of Congress: Memory, Reason, Imagination by Margaret E. Wagner and Presidents: A Library of Congress Book by Martin W. Sandler. Okay dog owners, it’s the beginning of National Scoop the Poop Week. Enough said. In April we’ve been celebrating Poetry Month. I actually wish every day were Poetry Day for children and that a poems were part of their daily literary diet. In the last couple of years, single poetry volumes for children ages two through eight—the work of Joyce Sidman and books like Marilyn Singer’s Mirror Mirror—have increased. 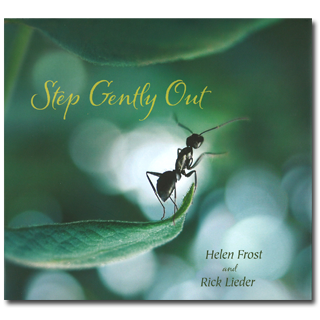 In 2012 Helen Frost added her own offering for this age group with a new picture book, Step Gently Out, with art by Rick Lieder. A bumblebee flies across rainbow-colored endpapers, welcoming readers into the subject matter of the book: insects engaged in their daily activities. The text begins: Step gently out, / be still, and watch / a single blade of grass. / An ant climbs up to look around. / A honeybee flies past. Crickets, moths, spiders, and a praying mantis all strut across the stage; the day turns to night. In the morning the spiderweb is “splashed with morning dew.” In a text barely more than a hundred words, Helen Frost captures the magic and excitement of the insect world. Then, at the end of the book, the featured creature gets a photograph and a paragraph of information that tells about the insect and how to find it or behave around it. The common yellow jacket can sting so “don’t get too close.” The subjects of the poem feature delicious names—orb-weaver spider, ebony jewelwing damselfly, Big Dipper firefly. 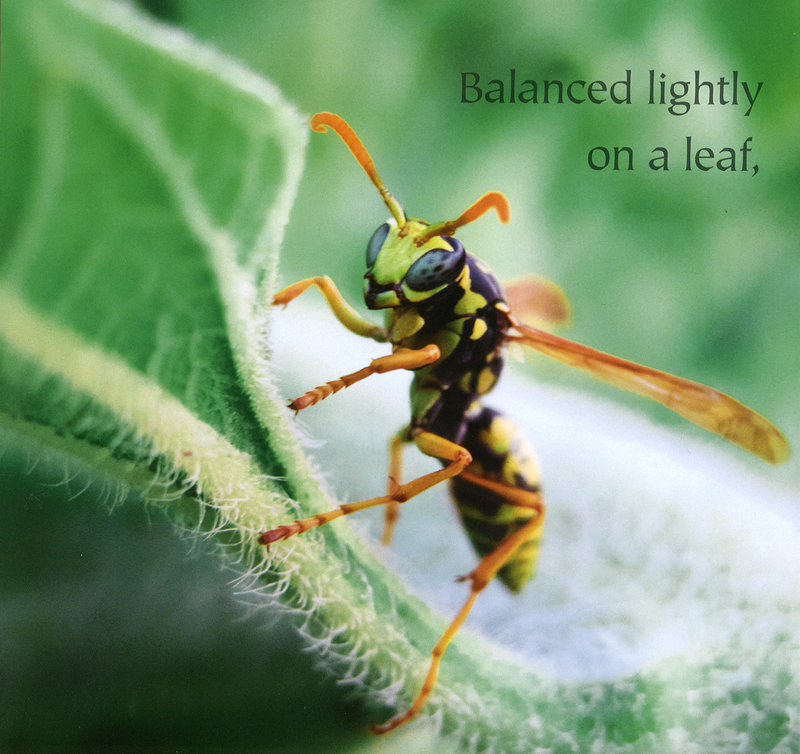 Rick Lieder creates brilliant photographic compositions that match the text and make insect identification easy for even the youngest viewers. The images are breathtaking. When introduced to children, the book elicits cries of “this is so beautiful.” And it is—both in text and art. Step Gently Out not only fosters a love of poetry but also of the creatures it describes. It shows passage of time and the behavior of some of our most populous occupants of the planet. It can be used to celebrate National Poetry Month or on any day of the year. It is one of those rare picture books where the text, art, and design merge seamlessly together to create a spectacular book. Originally posted April 24, 2012. My little boy loves bugs and I am constantly looking for new books about them to satisfy his curiosity. This one looks fantastic – how marvelous to be able to introduce him to poetry through a subject he’s already so interested in. Once again, a gem I might not have known about without the almanac – much appreciated! I have just given this book to two of my granddaughters in their Easter baskets. Seemed a much better present than candy! All the adults wanted to read it and look at the pictures as well. Mary and McCourt: I am so happy to hear of this book getting into the hands of children. It combines poetry and science — and as you suggest pleases both adults and children. “Step gently out, / be still, and watch / a single blade of grass. / An ant climbs up to look around. / A honeybee flies past.” – That’s the kind of writing that will stop me in my tracks, and then send me out looking for the book. I had read and loved Diamond Willow (because of Anita) and Step Gently Out sounds like a book with great possibilities, both for the reader and the author. I can’t wait to read this one. I sincerely love Helen Frost. Crossing Stones stopped me in my tracks – the format and the theme both spoke to me in a way I didn’t expect. But now, I’ve come to expect amazing things from the author of Keesha’s House and Diamond Willow and the partnering of Helen’s amazing words with these phenomenal photos is just a stroke of brilliance. I cannot wait to see it. Thanks for highlighting it, Anita! Gordon and Karen: Yes, this is another fabulous Helen Frost book. Thank you for this daily gift, Anita. Looks like a truely lovely book. Poetry and bugs – who’d of thought. I have such limited knowledge of poetry that this was great for me! Thanks for introducing me to Joyce Sidman. Anita, This book is a staple in my first grade classroom and my students love it. I’m sure you have seen by now, Sweep Up the Sun? It is even better! We were blessed to have Rick do a slide program (and Helen do a group poem). Great day with great books and people. I can’t wait to see their firefly book coming next year!